To make the month of May merrier, SFEMS is delighted to present Antic Faces, a new ensemble featuring well-known Bay Area artists Shira Kammen, violin and viol; Mindy Rosenfeld, flute; David Morris, viol; John Lenti, lute and viol; Julie Jeffrey, viol and cittern; and Peter Hallifax, viol and bandora. 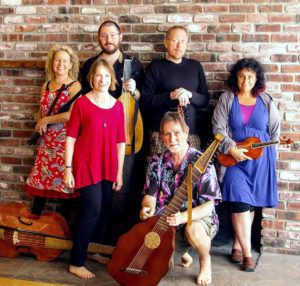 Their program will conjure for us the courtly and theatrical entertainments of the Elizabethan world with works of Dowland, Byrd, Morley, Phillips, Allison, and more. The program also will feature several Fantasies and a pair of In nomines by Gibbons. Performances take place in Palo Alto, Berkeley, and San Francisco the weekend of May 10–12. Antic Faces recreates an iconic Elizabethan ensemble, which was the first of its kind, specifically drawing from different instrument families (winds, bowed strings, plucked and strummed strings) to create a richly varied texture that quickly captured the imagination of composers in England and abroad. The playful dialogue between the violin and Renaissance flute, the virtuosic flash of the lute, the lushly intertwining support of the bass viol, against the shimmering backdrop of the wire-strung bandora and cittern: this truly irresistible combination, endowed with endless possibilities of invention and variety, became a centerpiece of courtly and theatrical entertainments. The members of Antic Faces contributed these notes on their concert. This program joins (joynes?) English music that originally came from two very different sources: the Church and the Theatre. From the rich counterpoint of the great church composers of the 16th century, the English developed their iconic repertoire for a consort of viols. 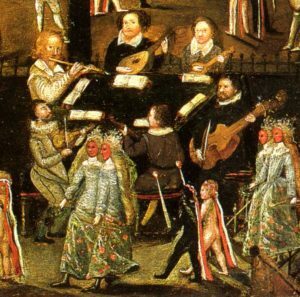 From the quite different song and dance tradition of Elizabethan theatre emerged the quite different “consort of six,” a much rarer beast, featuring much more than just viols. Not much needs be said about the consort of viols, which has entranced modern audiences for decades now. By around 1600 (the period of our concert), the consort of viols had been fully established in England for three generations. The English repertoire for viol consorts was then, and remains, one of the pinnacles of European music. On the other hand, the “consort of six,” and its music, may need some introduction. Thereafter, many similar descriptions (and pictures) of this remarkable combination of specific instruments emerge, continuing up to the English civil war. In 1599 (and again, reprinted by popular demand, in 1611) Thomas Morley published his “first booke of consort lessons made by diuers exquisite authors, for six instruments to play together, the treble lute, the pandora, the cittern, the base-violl, the flute & treble-violl.” In 1609, Phillip Rosseter published his “Lessons for Consort” for the identical line-up. In 1614, William Leighton’s “Teares or Lamentations of a Sorrowfull Soule” included a set of songs accompanied by our “consort of six. Several sets of manuscript part books for this exact group also survive from around 1600. In a short time, our curious ensemble had gained mainstream popularity. In Europe, Praetorius and other foreign writers enthusiastically describe the “English Consort” of the time, featuring these instruments. Clearly, there was a great demand for this unique ensemble both in England and abroad. The “consort of six” is a distinctive sound. Three linear instruments supply the skeleton of the piece: the bass viol, flute and treble viol. The treble viol (or violin) plays the tune. The bass viol carries the bass line, and the flute usually plays an alto line (at least nominally, because it often transposes the part an octave above the tune). All three of these instruments are frequently called upon to embellish their lines with divisions, either extempore or composed. Imitative counterpoint (the mainstay of the consort of viols) is restricted to cameo appearances, if that, in the “consort of six” repertoire. The lute part is, in many ways, the secret ingredient in the six-part dish. It sometimes plays a sort of continuo part, holding down chords that bind the three linear instruments, and adding choice cadential figures. However, sometimes, especially on repeated sections, the lute delivers a unique running embellishment of either the flute part, or the violin part, or even a completely new line derived from both or neither of these. The cittern and bandora round out the group, providing a two-piece wire-strung continuo group, a sort of portable harpsichord (but with dynamics). Their task is limited, but essential; for their combined sound is unique, and always highlighted in contemporary descriptions of the consort of six and related theatre music. They add resonance and glow. Many scholars think that the classic “consort of six” is actually a formalized version of the sort of arrangements that theatre musicians routinely made, taking popular dance music or songs, and setting them for whatever instruments suited the occasion. This makes sense to us, and this idea has informed our own arrangements as well as our approach to the original written (published and manuscript) settings. The pioneering scholar and performer in this field, the late Sydney Beck, wrote that “ . . . these consort [of six] settings represent the extraordinary amalgam of an incipient art of orchestration and a mature technique of embellishment.” We could not agree more, but we would add that this “Heavenly Noyse,” as one contemporary described it, is also, in this program, a perfect contrast to the exquisite counterpoint of the stately viol consort. Fantasies The Fantasy, or Fancy, is the backbone of the English viol consort repertoire. It is a conversation between several (here, 3 or 4) viols, with plenty of imitation between parts. In Nomines Taverner wrote the first one, as part of a mass, around 1530. For the next century and a half, over 50 composers wrote over 150 of them, all following Taverner by using the same cantus firmus (the sequence of about 50 long notes that tie the piece together), usually for viol consort. We’re playing two of them, both by Gibbons. In the 5-part piece, we allocate the cantus firmus to the flute. They are similar in style to fantasies, but woven around the cantus firmus, which is most often found in the second part from the top. Dances Pavanes and Galliards, the staple dances of the 16th and early 17th century throughout Europe, they usually have three sections, each of which is repeated. Grounds and Dumps The Jewes dance, Phillips Dump, and The Queen’s Treble are all variations on repeated simple bass patterns, an Elizabethan specialty. Divisions Almost all the music we play contains some basic divisions (ornamented lines). Divisions are an essential part of this music; some pieces (like Barafostus’ Dream) are simply a set of complex divisions on a relatively simple tune. In other pieces, all the players get to add their own divisions at will, just to add zest to the piece. Original Consort of Six Compositions Although, as we noted, most of the extant pieces for the “consort of six” are arrangements of pre-existing popular songs or dances (Lacrime, Phillips Pavan and Galliard, Joyne Hands, etc. ), some are thought to have been composed specially for the ensemble, such as the Batchelor’s Delight, which only occurs in this “consort of six” arrangement. Performances take place 8:00 p.m., Friday, May 10, at First Presbyterian Church, 1140 Cowper Street at Lincoln, in Palo Alto; 7:30 p.m. Saturday, May 11, at St. Mark’s Episcopal Church, 2300 Bancroft Way, in Berkeley; and 4:00 p.m. Sunday, May 12, at St. Mark’s Lutheran Church, 1111 O’Farrell at Gough, in San Francisco. Tickets are available online, through the SFEMS box office at 510-528-1725, or at the door 45 minutes before each performance.